The legendary band gave a rare London performance, bringing out the talkbox and keytar to party like it was 1981. The Zapp Band burst onto the scene in a period in which funk music was going through a seismic change. The classic funk sound, as defined by the likes of James Brown, George Clinton, Parliament-Funkadelic and Sly Stone, was under threat. Disco robbed many of the classic funk acts of record deals and performances, as disco’s four-on-the-floor beat transformed the music scene. Disco was a producer’s genre. A producer, rarely the artist, meticulously arranged large, orchestrated disco sounds. Night clubs began hiring disco DJs rather than funk bands, who could spin discs all night long for a fraction of the cost. Funk bands suddenly found their musical style out of fashion and their ability to perform (and make money) restricted. Some groups made the decision to downsize whilst others chased the trends and went for pop-disco hits. Fortunately, as the eighties rolled around and disco had reached it’s peak, a new brand of “naked funk” emerged. This new genre of funk was, similar to disco, largely a producer’s genre. New technology opened up new electronic sounds. The new funk of the eighties was often electronically programmed, featuring deeply funky synth bass, but retaining the on-the-one beat and guitar. And, thanks to the technology, fewer musicians were needed to play. As a result, smaller funk outfits became the norm. The Zapp Band were among the most influential in this new funk movement. Roger Troutman and his brothers Lester, Terry and Larry formed the nucleus of the group, with Roger acting as the groups’s lead guitarist and vocalist, and main creative force. The group had developed an energetic stage performance and Roger had begun to experiment with the talk box, giving the group their own distinct sound. As the group gained a reputation in their native Dayton, Ohio, they were discovered by two of funk’s old guard, George Clinton and Bootsy Collins. Clinton signed the group, and Bootsy produced their debut album Zapp, which featured ‘More Bounce To The Ounce’. The song, featuring a heavy drum beat, synthesised bass and Roger on the talkbox was a smash hit, and defined the Zapp Band sound. After the release of Zapp, and sensitive to George Clinton’s ongoing financial and drug problems, the group decision made the wise decision to part company, and Roger took the lead in writing and producing the band. They struck on a winning funk formula, one that would be influential for hip-hop and rap artists later in the decade and in the nineties. Yet, tragedy would strike the group as Larry fatally shot his brother Roger in 1999, before turning the gun on himself. How does a band continue on after the tragic death of it’s leader and driving creative force? It’s a question that Lester and Terry “Zapp” Troutman no doubt wrestled with in the aftermath of their brothers’ deaths. It took a while, but the group eventually re-grouped and released Zapp VI: Back By Popular Demand in 2002. 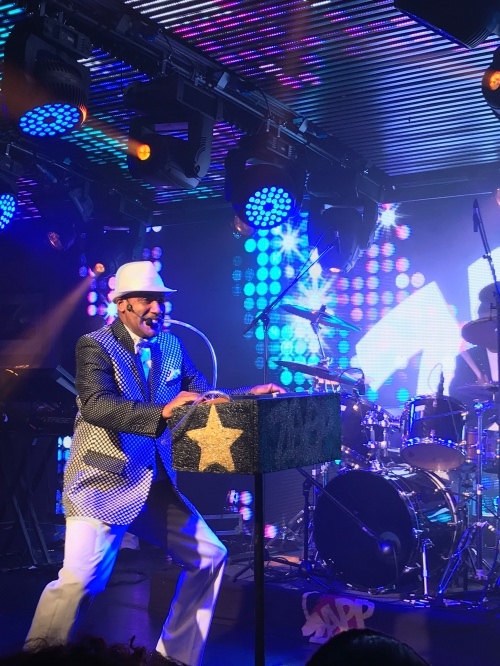 Since then, the group have become a fixture on the touring circuit, building a reputation as one of the hardest working bands in the business and, importantly, honouring the work of Roger Troutman. This year the group have released a new album, Zapp VII: Roger & Friends. The album features guest spots from the likes of Bootsy Collins, Tuxedo (Mayer Hawthorne and Jake One) and Mr Talkbox. And, thanks to new technology, Roger appears – his vocals taken from old demos and recordings. To promote the album the current incarnation of the group, featuring Lester and Terry, are on a whirlwind tour of Europe, taking in an impressive 6 cities in 8 days. If the group were exhausted from the travelling, they showed no signs of tiredness at their energetic performance in London. It’s always a good sign when the whole band dances on the stage in unison, immaculately dressed in matching outfits. And as Zapp took the stage, it was clear we weren’t quite prepared for the intense performance they were about to deliver. For the next 90 minutes the Zapp Band didn’t stop moving, all moving and grooving to the infectious synth grooves, putting on an elaborate show in an intimate setting. The group have always put on extravagant performances, but this was unlike anything I’d seen before. The slow is very slick. Each member of the group (excpet Lester who played drums impressively all night) plays multiple instruments, dancing complex choreography whilst doing so, and often disappearing back stage for regular costume changes. It was bizarrely brilliant and thoroughly entertaining. More than just a gig, this was a funk revue. Terry “Zapp” Troutman leads the Zapp Band at Under The Bridge. The funk itself was suitably heavy. The group opened on an extended and extremely funky version of ‘So Ruff, So Tuff‘ with Terry taking on talk box duties in the absence of Roger. Much of the music is simply Lester’s pounding drums (he surely is one of the most underrated drummers in the genre) and synth bass and keys, which a smattering of guitar and key-tar and electric bass. It’s not necessarily fancy, but with the trademark talk box, it proved infectious. The whole show felt like one big jam, full of heavy beats and tasty synth bass, made complete with a sprinkling of guitar and sax when required. If Daft Punk had been around in the seventies and eighties, it probably would have sounded like this. All the big Zapp and Roger hits were present, from stunning renditions of ‘I Heard It Through The Grapevine‘ and ‘Dance Floor‘ to a couple of slow jams, including the classic ‘Computer Love‘ (in which Zapp somehow predicted the rise of dating apps) and ‘I Want To Be Your Man‘. There was even a rendition of ‘California Love‘, which Roger contributed vocals to on the original by 2Pac and Dr Dre. The group also managed to slide in a couple of songs from their new album, including fantastic ‘Shy’ (which features Tuxedo on the record). Yet, as good as the band sounded (and it was very, very funky), it was the energetic performance that made the show extra special. The entire show was finely choreographed: each member was given their turn in the spotlight to lead the band, often switching instrument mid-song. The dance moves, while suitably retro, were thoroughly entertaining. The costume changes were also an unexpected treat, particularly the white jackets embroidered with LED lights, which lit up in unison as the stage lights dropped. There was even time during the mammoth performance of ‘More Bounce To The Ounce‘ for half the group to switch from wearing afro wigs (and bouncing them in unison to the beat) to wearing pimp suits. As a finale, most of the group led a conga line around the venue, before downing instruments and taking the time to speak and snap selfies with the crowd. A very nice gesture, considering how tired several of the members looked after a frantic 90 minute show in the middle of an exhausting tour. Sadly, the crowd at Under The Bridge wasn’t huge for the Zapp Band. They could quite easily have chucked in a shorter, less energetic show and simply left for the next date. But they didn’t. Instead, they treated us to a stunning, memorable performance that honoured the legacy and music of their brother Roger. In fact, they’re probably the best funk outfit on tour today. As good as George Clinton’s current Parliament-Funkadelic are, they do suffer from a questionable choice of material. The Zapp Band have no such issues. Their concise, choreographed performance was much more enjoyable. At the beginning of the show, their manager introduced them as the “hardest working band in the business”. From their London performance, it’s hard to disagree. Brought up on a healthy diet of soul and funk, Haff's dream was to become the first British member of The Temptations. Realising that this dream could never be realised, he now curates The Funk & Soul Revue with website administrator Will.